Each year, the GKH partners plan something different to celebrate their experienced and dedicated support staff of paralegals, legal assistants and administrative personnel. This year’s plan was to have lunch together before taking the African-American Heritage Walking Tour of Lancaster City. Instead, with heavy rain threatening, the tour guides and storytellers came to GKH. 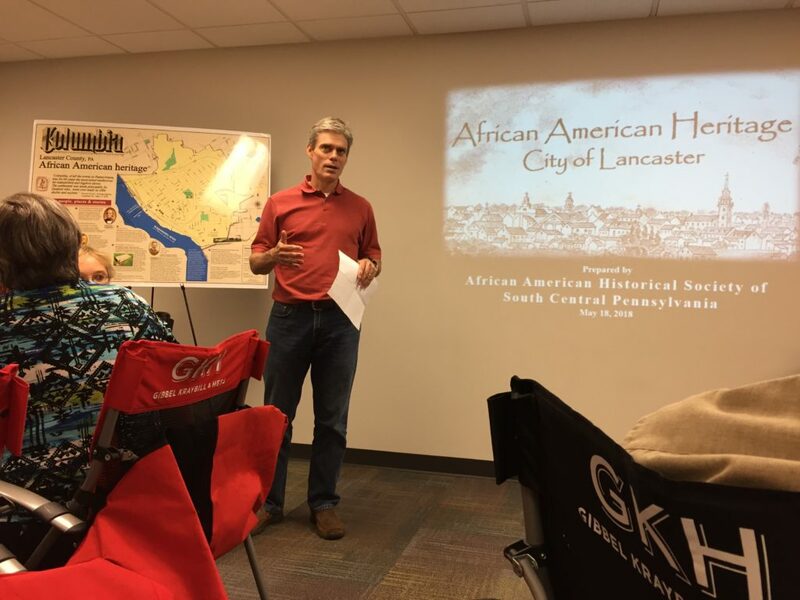 Local historians Randy Harris, Dr. Leroy Hopkins and Daniel Ness highlighted area historical sites connected with the Underground Railroad, and told the stories of several nineteenth-century black citizens and business owners from Lancaster. GKH’s own Kathleen Anderson has family ties to several of the people highlighted on the tour, and serves as a storyteller at the site of her great-great-grandfather’s barber shop on East King Street for the monthly walking tours of Lancaster. The presenters emphasized the importance of preserving these sites and telling the stories of the people who lived here, or who travelled through seeking freedom. GKH zoning and land use attorney Dwight Yoder serves as legal counsel to Preservation Pennsylvania in its fight to preserve York County’s historic Mifflin House. In appreciation for the excellent presentation, GKH made a donation to Preservation PA for the Mifflin House preservation effort. Attorney Dwight Yoder serves as emcee.